No joke, we go through toasters like they're going out of style. I can't tell you how many I've had over the years, both before getting married and since. I've had cheap ones and expensive ones, but never found one that I could rely on to consistently give me perfectly golden brown toast. Until now. At least so far. 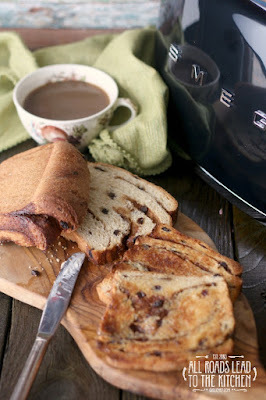 I was recently offered the opportunity to try a SMEG 2-Slice Toaster. With it's fun 50's retro-look and extra-side slots, I couldn't resist. The hardest part was choosing whether I wanted it in cream, chrome, black, or sky blue. I seriously love all of them, and while I think I actually wanted cream the most, I thought that black would fit in better with our current kitchen, I choose that. It may have a fun mid-century style to it, but it has modern features including self-centering racks that hold the toast upright and six browning levels offer precise control of browning, as well as a removable crumb tray and a backlit chrome knob with four functions: Reheat, Defrost, Cancel, Bagel. To break in our new toaster, I wanted to make a loaf of bread that would perfect for toasting. There are a few favorites in this house. 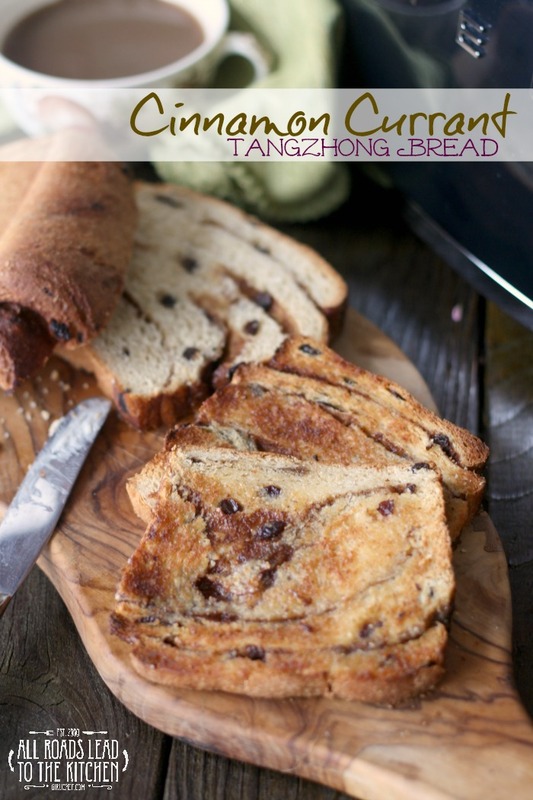 This Granary Loaf and Whole Wheat Tangzhong are probably our top two, and this English Muffin Bread makes darn good toast, too. But my daughter has been nudging me to make cinnamon raisin bread lately, so I figured a good loaf of that was in order. Only I used currants; I think they taste pretty much the same in a loaf of bread and are less unruly due to their smaller size. Since trying the tangzhong method for the first time, I've been wanting to "tangzhong" all my loaves (yes, I'm using it as a verb). Tangzhong is a water roux, which when added to bread dough produces a soft and fluffy loaf that stays that way for days. It's super simple to make (just water and flour cooked for a short period of time to form a roux, then cooled). Don't skip it because it absolutely will not produce the type of loaf that I just described without it. My plan worked perfectly. 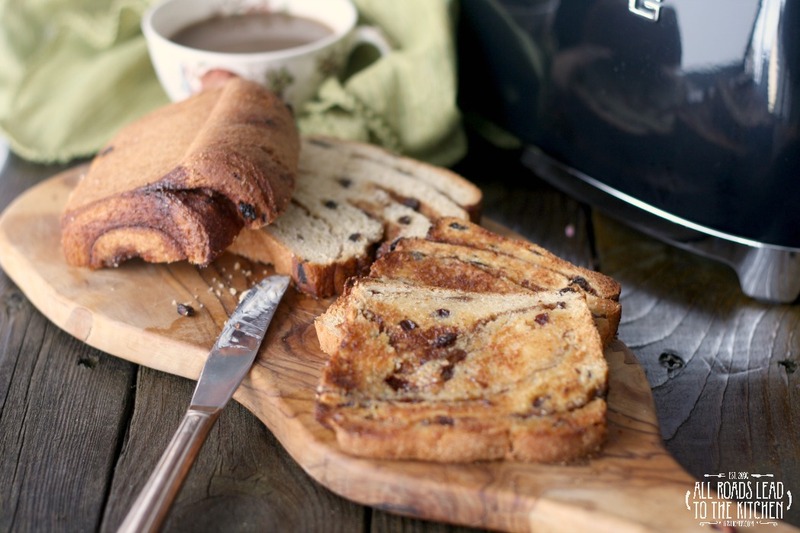 Soft, fluffy bread studded throughout with plump little currants and swirled with the perfect amount of cinnamon and sugar - that toasted like a dream! I could (and might have) eaten this toast for every meal of the day. My SMEG toaster browned the bread evenly and to just the level of brown that I like it (on setting 3). We've toasted bagels, toaster strudels, and storebought bread in it as well, all with great results. Could this be the toaster that breaks my curse? So far, so good. Here's to hoping the toast gods are looking favorably on me for the rest of my days (and you on yours)! Yes, I love toast. This soft and fluffy bread is studded with currants and swirled with cinnamon and sugar. Makes perfect toast! Mix the flour and water together in a very small saucepot set over medium heat. Cook, stirring almost constantly until the mixture thickens to a roux; it should register 145° F on an instant-read thermometer or make lines in the pan as you pass the spoon through the mixture. Remove from heat. Scrape the mixture into a small bowl and allow it to cool completely before using. The Tangzhong can be refrigerated by pressing plastic wrap directly onto its surface, then transferring to the refrigerator once cool. Can be made about 2 days in advance. Bring back to room temperature before using. Add all ingredients in order listed EXCEPT THE CURRANTS to the pan of a bread machine. Select the "dough" cycle; when the kneading cycle has about 5 minutes left, add the currants. Allow finish kneading and then rising until doubled in bulk. Combine the brown sugar and cinnamon for the filling and set aside until needed. Turn out onto your work surface. Only add flour as needed to keep from sticking - you may not need any at all. Roll into a 1/4-inch thick rectangle that is about 4-5 inches wide at the shortest edge. Brush with the milk for the topping, then scatter with the cinnamon-sugar mixture, leaving a 1-inch border on one of the short edges. Starting at the opposite short edge, roll into a tight log (jellyroll style). Set the log into your prepared loaf pan. Cover with plastic wrap and allow to rise for about 40-45 minutes, until the dough has risen and looks puffy. Preheat oven to 350° F during last 15 minutes of rise time. Remove plastic wrap and slide into preheated oven to bake for 30-35 minutes, or until golden. Turn the loaf out onto a wire rack and allow to cool completely before slicing. You could also make cinnamon rolls by slicing the log into 1-inch pieces and putting them in a pan. They won't take as long to bake, so start checking them when you start smelling them. Really, you could shape this bread in any way that you want. Try letter-folding the dough after you've spread the cinnamon-sugar mixture on it. Pinch the edges sealed, then roll into a loaf and place in prepared pan. 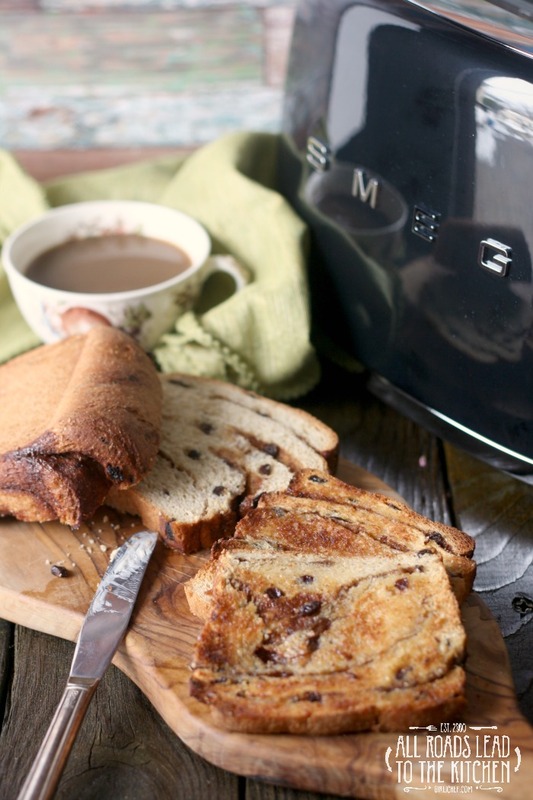 Do you want a SMEG 2-Slice Toaster of your own so that you can toast up some of your favorite bread? The winner will get their choice of the colors you see below (subject to availability). To enter, you must be at least 18 years of age and reside in the USA. Enter for your chance to win by leaving a comment on this post telling me what kind of bread you think makes the best toast! Once you've left your comment, be sure to check the box in the rafflecopter widget telling me that you did. This will open up a bunch more entry options to increase your chances of winning this awesome prize! This contest closes at 11:59 pm ET on 02/28/16. Estimated value of this prize is $149.95 (USD). One winner will be drawn from qualifying entries and notified within 48 hours of the close of this contest and given 24 hours to respond. If no response is received within the allowed time, a new winner will be chosen. 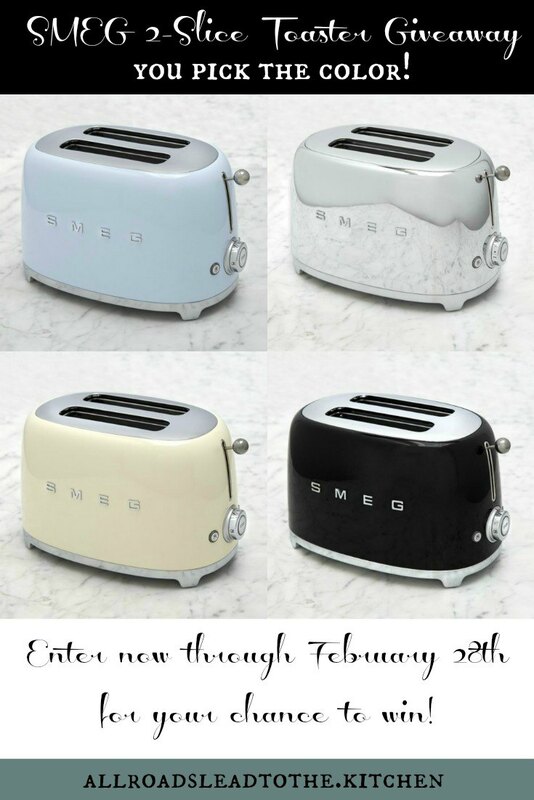 SMEG USA provided me with a complimentary toaster for the purpose of review. They are also providing and shipping the toaster for the giveaway.